1. Post a selfie with a cosplayer. Tag it #EmpiresAtCrocker. 2. Post a pic of Empire's Mobile Lounge. Tag it #EmpiresAtCrocker. 3. Post a pic of Nooligan or the comic book Union Street Choir (found at Nooligan's table). Tag it #EmpiresAtCrocker. 4. 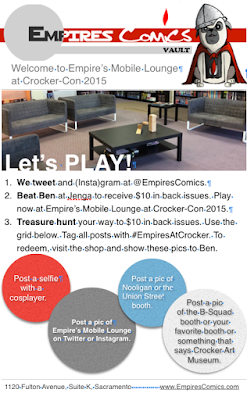 Post a photo of the B-Squad comic, Long John comic, your favorite booth or of something that says Crocker Art Museum. 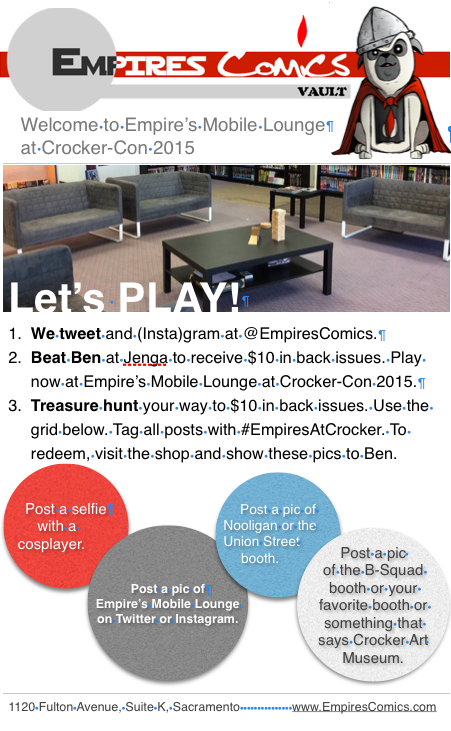 Tag it #EmpiresAtCrocker.